A divorce in California can involve complicated situations that require multiple forms to file to the court. For an uncontested divorce, a FL-170 form, or a Declaration for Default or Uncontested Dissolution or Legal Separation, must be filed. With this form, you're stating by mail what you would say in court during a divorce trial. However, a mailed return judgment from a judge could take months. And filling out a FL-170 that's accurate is a must if you don't want a judgment of rejection. Ask your divorce lawyer for the FL-170 form. Fill out information on your lawyer at the top of the form. Provide his phone number, fax number or email (if applicable) and your name as his client. In the second box down, write in the county in California where you're filing the divorce. This goes next to the text "Superior Court of California, County of ..." Write in the street address, mailing address, city, zip code and branch name of the court. In the third box, indicate who the petitioner of the divorce is. Also indicate who the respondent is if you received a response from your spouse. In the fourth box, indicate whether your declaration is dissolution of a marriage or just a legal separation. The heading in this box says "Declaration for Default or Uncontested..."
Write the case number to the right of the fourth box. Read the first two declarations below the boxes. Agree in the first declaration that everything you place in the form is true and you'd swear to its truth in court. Agree in the second declaration that you can prove your case on the form without having to appear in court. Below these statements, place a check in the box to officially validate the above declarations. Go to question four and, if applicable, place a check in the box indicating whether this will be a default case. In a default case, the other spouse never replies to a divorce petition so a divorce can be completed using this form. Check the next box for uncontested divorce, if applicable. In this case, your spouse did respond to the petition, but both of you agreed to not contest the divorce to prevent legal fees. Read over question five for settlement agreements. In the subhead A, place a check next to whether your settlement is a mutual agreement or through a stipulated judgment. A stipulated judgment is an agreement between you and your spouse on settlements, but with the provision enforcement actions can take place if either one doesn't comply. Look over the three choices of question six. These ask Declaration of Disclosure or more specifics on what the divorce entails. Choose whether you and your spouse are filing concurrently, the case is a default case or if it's uncontested. Read questions seven and eight about child custody and visitation. Check both of these only if you and your spouse have come to agreements for both in Form FL-180. Choose a, b, c or d in question nine over spousal, partner or family support. Place a check in choice A and you forever give up any method of ever seeking spousal support. If you check choice B, you leave open the possibility of providing or asking for spousal support in the future. Provide the name of your spouse. In choices C and D, you select whether spousal or family support has already been agreed upon in form FL-180. Check off question 10 about whether child support has been worked out in form FL-180. Questions 11 and 12 ask you if you or your spouse are or are not receiving public assistance. Question 13 will give you four subsections asking for gross income information if you're seeking support or providing support for children who are minors. Place a check in question 14 if you've indicated on form FL-180 that you and your spouse are the proven parents of the children in the support agreements. Check question 15 if any attorney fees are involved and you've made agreements of payment with your spouse on form FL-180. Choose whether the petitioner or the respondent will revert back to their original name in question 16. This will also be indicated in form FL-180. Read through declarations 17 and eighteen. Declaration 17 states that you and your spouse are divorcing due to irreconcilable differences and that marriage counseling won't help repair the marriage. Declaration 18 states that the form will be reviewed by a judge who will make a judgment based on the facts you provided. 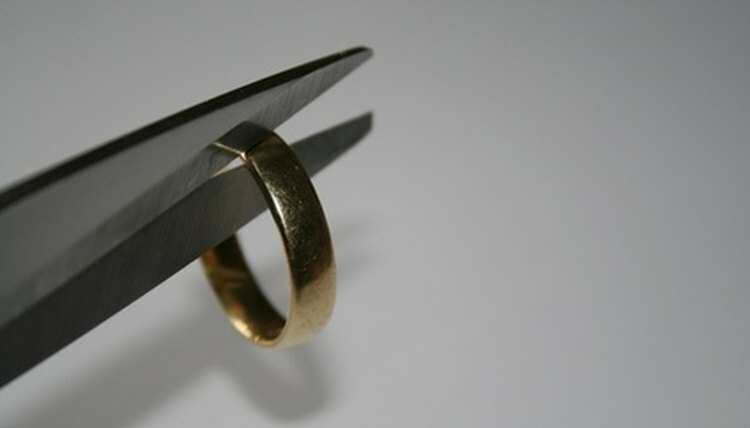 Review the box for dissolutions of marriages filed in other states. Check the box at bottom to request dissolution of marriage or domestic partnership under a divorce filed in another state and to request a reserve of jurisdiction over all matters not covered in the FL-170 form. Check the box in section 22 if you're requesting a legal separation. This is strictly a separation and not a legal divorce. Write in the date, type or print your name on the left bottom line and then your signature on the right line. Give the completed form to your divorce lawyer to look over and send to the court. Greg Brian is a freelance writer who took his diverse writing skills to the Internet in 2007. He currently writes for various prestigious websites. He earned an Associate of Arts degree in business management from Trend Business College in 1993. Brian, Greg. "Instructions for Form FL-170." , https://legalbeagle.com/6579198-instructions-form-fl170.html. Accessed 22 April 2019.